During the Goryeo dynasty Jinul strongly influenced Korean Buddhism. He was the first monk to be appointed a national teacher and advisor by the king, having written a book presenting the Seon tradition from the Song dynasty. And this Seon tradition preserved well to this day, after Taego Bou brought his Dharma transmission to Goryeo. Under annexation by Japan most monks were forced to marry - this lasted about 40 years until the act of purification. During those times, masters like Gyoengheo and Mangong kept Dharma transmission alive. 21th centry, the few left this Dharma transmission. "남진제 북송담'(南眞際 北松潭) (Jinje to the south, Songdam to the north)." is well-known phrase in Korean seon tradition these days. Others are Seungsahn, Daewon. Chan was transmitted into Unified Silla (668-935). [web 1] Beomnang (法朗, Pŏmnang, Peomnang) (632-646), who studied with the Fourth Patriarch Dayi Daoxin (道信) (580-651), was the first to bring the teachings to Korea. Beomnang transmitted his teachings to Sinhaeng (神行) (704-779), who also traveled to China. Sinhaeng studied with Puji (651–739), a successor of Yuquan Shenxiu (died 706), the head of the East Mountain Teaching of Chan. Seon was further popularized by Doui (道義) (died 825) at the beginning of the ninth century. Seon was gradually further transmitted into Korea, as Korean monks of predominantly Hwaeom (華嚴) and Yogacara (唯識) background began to travel to China to study the Hongzhou school of Mazu Daoyi (709–788) and his successors and the Rinzai school of Linji Yixuan. 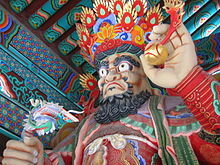 Mazu's successors had numerous Korean students, some of whom returned to Korea and established their own schools at various mountain monasteries with their leading disciples. Initially, the number of these schools was fixed at nine. Seon was termed the nine mountain schools" at the time. Eight of these were of the lineage of Mazu Daoyi (馬祖道一) (709-788), as they were established through connection with either him or one of his eminent disciples. The one exception was the Sumi-san school founded by Yieom (利嚴) (869-936), which had developed from the Caodong school (曹洞). Toǔi (道義 Doui) (died 825), who studied with Zhizang (735-814) and Baizhang Huaihai (百丈) (749-814) is regarded as the first patriarch of Korean Sŏn. He founded the Kaji Mountain school (迦智山 Gaji san school). The Nine mountain Schools adopted the name Jogye Order in 826. The first record of the Nine Mountains school dates from 1084. By the eleventh century Sŏn Buddhism became established in Korea. It distinguished itself from the existing Five Schools[note 1] and their scriptural emphasis. Tension developed between the new meditational schools and the previously existing scholastic schools, which were described by the term gyo, meaning "learning" or "study". Efforts were needed to attain mutual understanding and rapprochement between Sŏn and these scholastic schools. The most important figure of Goryeo-era Seon was Jinul (Hangul: 지눌; Hanja: 知訥, 1158-1210), who established a reform movement in Korea. In his time, the sangha was in a crisis of external appearance and internal issues of doctrine. Buddhism was seen as infected by secular tendencies and involvements, such as fortune-telling and the offering of prayers and rituals for success in secular endeavors. This perceived corruption was seen to create a profusion of monks and nuns with questionable motives. Therefore, the correction, revival, and improvement of the quality of Buddhism were prominent issues for Buddhist leaders of the period. Jinul sought to establish a new movement within Korean Seon, which he called the "samādhi and prajñā society". Its goal was to establish a new community of disciplined, pure-minded practitioners deep in the mountains. He eventually accomplished this mission with the founding of the Songgwangsa (松廣寺) at Jogyesan as a new center of pure practice. Jinul's works are characterized by a thorough analysis and reformulation of the methodologies of Seon study and practice. He laid an equal emphasis on doctrinal teaching and Sŏn practice. One major issue that had long fermented in Chan, and which received special focus from Jinul, was the relationship between "gradual" and "sudden" methods in practice and enlightenment. Drawing upon various Chinese treatments of this topic, most importantly those by Guifeng Zongmi (780-841) and Dahui Zonggao (大慧宗杲) (1089–1163), Jinul created Pojo Sŏn, a "sudden enlightenment followed by gradual practice" dictum, which he outlined in a few relatively concise and accessible texts. Jinul incorporated Dahui Zonggao's gwanhwa (Chinese: 觀話; pinyin: guān huà, "observing the critical phrase") into his practice. This form of meditation is the main method taught in Korean Seon today. Jinul’s successor, Chin’gak Hyesim (혜심/慧諶: 1178~1234) further emphasized the hwadu (Ch. huatou, "word head" or "critical phrase") practice. He collected 1,125 gongans in his Sŏnmun yŏmsongjip ("The Collection of Verses and Cases", 1226). Hyesim encouraged female practitioners to practice hwadu, where-as women’s Buddhist practice was limited to chanting and sūtra-readings. It was during the time of Jinul that the Jogye Order, a Seon sect, became the predominant form of Korean Buddhism, a status it still holds. Taego Bou (1301–1382) studied the Linji school in China and returned to unite the Nine Mountain Schools. There would be a series of important Seon teachers during the next several centuries, such as Hyegeun (Hangul: 혜근; Hanja: 慧勤, 1320-76), Taego Bou (1301–82), Gihwa (1376–1433) and Hyujeong (1520-1604), who continued to develop the basic mold of Korean meditational Buddhism established by Jinul. At the end of Goryeo and during Joseon the Jogye Order was combined with the scholarly schools. It lost influence under the ruling class, which embraced neo-Confucianism. [web 2] Buddhism was gradually suppressed for the next 500 years. The number of temples was reduced, restrictions on membership in the sangha were installed, and Buddhist monks and nuns were literally chased into the mountains, forbidden to mix with society. Joseon Buddhism was first condensed to Seon and Gyo. Eventually, these were further reduced to the single school of Seon. During Joseon, the number of Buddhist monasteries dropped from several hundred to a mere thirty-six. Limits were placed on the number of clergy, land area, and ages for entering the sangha. When the final restrictions were in place, monks and nuns were prohibited from entering the cities. Buddhist funerals, and even begging, were outlawed. A few rulers temporarily lifted the more suppressive regulations. The most noteworthy of these was the Queen Munjeong. The queen had deep respect for the brilliant monk Bou (보우, 普雨; 1515–1565), and installed him as the head of the Seon school. Buddhist monks helped in repelling the Japanese invasions of Korea (1592–98). Monks were organized into guerrilla units, which enjoyed some instrumental successes. The "righteous monk" (義士; uisa) movement was led by Hyujeong (1520–1604), a Seon master and the author of a number of important religious texts. The presence of the monks' army was a critical factor in the eventual expulsion of the Japanese invaders. Seosan made efforts toward the unification of Buddhist doctrinal study and practice. He was strongly influenced by Wonhyo, Jinul, and Giwha. He is considered the central figure in the revival of Joseon Buddhism, and most major streams of modern Korean Seon trace their lineages back to him through one of his four main disciples: Yujeong (1544–1610); Eongi (1581–1644), Taeneung (1562–1649) and Ilseon (1533–1608), all four of whom were lieutenants to Seosan during the war with Japan. Buddhism during the three centuries, from the time of Seosan down to the next Japanese incursion into Korea in the late nineteenth century, did not change very much. The Buddhism of the late Joseon Kingdom saw a revival of Hwaeom studies. There was also a revival of Pure Land Buddhism. With the Korean Empire started the Gwangmu Reform, a modernisation of Korea. The Korean Empire ended in 1910, when Korea was annexated by Japan. After the Second World War the United Nations developed plans for a trusteeship administration, the Soviet Union administering the peninsula north of the 38th parallel and the United States Army Military Government in Korea administering the south. The politics of the Cold War resulted in the 1948 establishment of two separate governments, North Korea and South Korea. Seon continues to be practiced in Korea today at a number of major monastic centers, as well as being taught at Dongguk University, which has a major of studies in this religion. The largest Buddhist denomination is the Jogye Order. In the 1980s a debate arose about "sudden" versus "gradual" enlightenment". [web 3] Since Jinul Korean Seon was based on the integration of practice and scholarly study in the slogan "sudden enlightenment, gradual cultivation". The modern Korean Seon master Seongcheol revived the slogan "sudden enlightenment, sudden cultivation", ascribed to Huineng. [web 5] The last three Supreme Patriarchs of the Jogye Order have a stance in this debate that is in accordance with Seongcheol. Korean Seon has been spread in the US by Seungsahn. He was a temple abbot in Seoul and after living in Hong Kong and Japan, he moved to the US in 1972, not speaking any English. 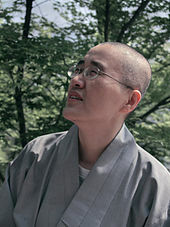 On the flight to Los Angeles, a Korean American passenger offered him a job at a laundry in Providence, Rhode Island, which became headquarters of Seung Sahn's Kwan Um School of Zen. Shortly after arriving in Providence, he attracted students and founded the Providence Zen Center. The Kwan Um School has more than 100 Zen centers on six continents. ^ Kyeyul chong (Vinaya school), Yŏlban chong (Nirvāna school), Pŏpsŏng chong (Dharma Nature school), Hwaŏm chong (Huayen school), and Pŏpsang chong (Yogācāra school). ^ "실용 한-영 불교용어사전". dic.tvbuddha.org (in Korean). Retrieved 2017-09-06. ^ "Jinul > Korean Seon Masters | Welcome to Jogye Order of Korean Buddhism". www.koreanbuddhism.net. Retrieved 2017-09-06. ^ "Bou > Korean Seon Masters | Welcome to Jogye Order of Korean Buddhism". www.koreanbuddhism.net. Retrieved 2017-09-06. ^ "Hyujeong > Korean Seon Masters | Welcome to Jogye Order of Korean Buddhism". www.koreanbuddhism.net. Retrieved 2017-09-06. ^ "한국 전통 간화선풍 되살린 선지식 진면목 - 법보신문" (in Korean). Retrieved 2017-09-06. ^ ""송담 스님 잘못 보필한 허물 참회합니다" - 법보신문" (in Korean). Retrieved 2017-09-06. ^ a b c Marshall 1995, p. 63. ^ a b c d e f g h i j k l m Keown & Prebish 2007. ^ Routledge Encyclopedia of Philosophy, "Buddhist philosophy, Korean"
^ Buddhism.org Buddhist eLibrary, "Toeong Seongcheol"